We’re back from LA from the big SOLIDWORKS World 2018 conference. It gave us an excellent opportunity to network with the SOLIDWORKS user community, connect with colleagues and customers and learn about updates from the SOLIDWORKS team. We enjoyed discussing our end-to-end PLM/PDM services and solutions and our expertise in implementing SOLIDWORKS systems and data migration projects. 3DEXPERIENCE Social Collaboration Services provide social media-style brainstorming in a collaborative, secure environment. SOLIDWORKS 3DEXPERIENCE PLM Services, created to demystify PLM, support everything from change management to project planning. SOLIDWORKS Product Designer brings a complete set of design capabilities including parts, assemblies, sheet metal, motion simulation, and drawings. SOLIDWORKS xDesign is a modeling application that runs in a browser on any device to provide optimal designs through the Design Guidance feature. 3DEXPERIENCE Marketplace Make connects designers and engineers with industrial service providers to turn designs into manufactured products. Read more about this below. Throughout the conference, SOLIDWORKS showcased its 3DEXPERIENCE platform and its various services and solutions. 3DEXPERIENCE is a collaborative business experience platform that interconnects all of the different Dassault technologies, including SOLIDWORKS for CAD and computer aided engineering, CATIA for 3D design, ENOVIA for product lifecycle management, SIMULIA for analysis and simulation, and DELMIA for digital manufacturing software. 3DEXPERIENCE is an interactive environment which can be implemented on premise and in the cloud. xLM Solutions has deep expertise and experience with the 3DEXPERIENCE platform. If you have any questions around the platform or need help implementing it, customizing it, migrating data to it or integrating it with other systems, please contact us. 3DEXPERIENCE Marketplace Make – provides the ability to take your design directly to manufacturers who offer such services as 3D printing, CNC machining, injection modelling and more. Designers and engineers can find the best manufacturer that fits their design. Marketplace Make accepts individual CAD designs or designs from SOLIDWORKS. It enables communication between designers and manufacturers through an efficient and collaborative workflow. 3DEXPERIENCE Marketplace Part Supply – gives engineers and designers the ability to source parts from millions of part supplier catalogs to search for the best part(s) to use in their design. They can search based on various criteria such as manufacturer, cost, materials, etc. 3DDrive – is a cloud-based repository service with the ability to upload, store and share data, similar to Dropbox or Google Drive. However, the 3DDrive solution goes beyond Dropbox or Google Drive because it allows users to see the relationship between files. When users perform an action on an assembly, for example, 3DDrive inquires if the same action should be performed on the child items. It includes a built-in viewer for 3D and 2D data and has enhanced search functionality to search beyond the file name to, for example, CAD properties, etc. This is a useful tool for smaller companies that do not need a full PLM system but need to collaborate and store their CAD data. During the conference, Dassault also announced the new SOLIDWORKS integration with the POWER’BY platform, which they will start with a few lighthouse projects. The POWER’BY data model support for SOLIDWORKS data will be available in the cloud and on premise later in 2018, although no specific dates were provided. It’s always exciting to hear the customer success stories at these conferences and to understand how users are innovating with their use of various products and services. We were inspired by Kyoungchul Kong, CEO, SG Robotics and Professor at South Korea’s Sogang University, whose company builds powered exoskeletons to help people with disabilities or limited mobility walk again. It was a joy to watch the presentation from Brent Bushnell, CEO of engineering and entertainment company Two Bit Circus. He captivated the audience with his engaging design experiences including tequila clouds, flame tanks, and robot bartenders. During the general sessions on the third day of the conference, we were impressed by the presentation by Tarso Marques, a former Formula One driver and owner and founder of Tarso Marques Concepts. He went into detail about how SOLIDWORKS helped him translate his vision into reality. Tarso and his team of designers are envisioning and manufacturing stronger, lighter parts using the new Topology Optimization features in SOLIDWORKS Simulation. During day three, we also heard exciting presentations from ENVE, a U.S. company that manufactures carbon fiber bicycles and parts, and Gilo Industries with its Mako jetboard (35 mph!). Appropriate for our L.A. location, we heard from the world of film making. Joseph Hiura and Robert Andrew Johnson, both art director and set designers, described their work in designing movie sets for such films as Oblivion, Passengers, Tron Legacy, and Batman v Superman. 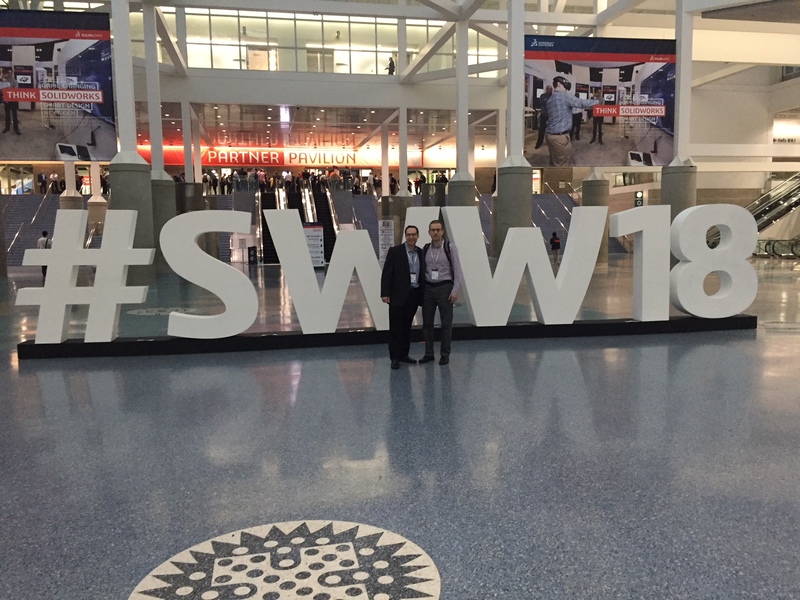 Which were your favorite parts of SOLIDWORKS World 2018? Let us know. Previous: Can PLM be Easy?